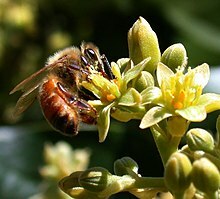 Honey bee on Avocado crop. Pollination is just one type of ecosystem service. Ecosystem services are the many and varied benefits that humans freely gain from the natural environment and from properly-functioning ecosystems. Such ecosystems include, for example, agroecosystems, forest ecosystems, grassland ecosystems and aquatic ecosystems. Collectively, these benefits are becoming known as 'ecosystem services', and are often integral to the provisioning of clean drinking water, the decomposition of wastes, and the natural pollination of crops and other plants. While scientists and environmentalists have discussed ecosystem services implicitly for decades, the Millennium Ecosystem Assessment (MA) in the early 2000s popularized the concept. There, ecosystem services are grouped into four broad categories: provisioning, such as the production of food and water; regulating, such as the control of climate and disease; supporting, such as nutrient cycles and oxygen production; and cultural, such as spiritual and recreational benefits. To help inform decision-makers, many ecosystem services are being assigned economic values. While the notion of human dependence on Earth's ecosystems reaches to the start of Homo sapiens' existence, the term 'natural capital' was first coined by E.F. Schumacher in 1973 in his book Small is Beautiful . Recognition of how ecosystems could provide complex services to humankind date back to at least Plato (c. 400 BC) who understood that deforestation could lead to soil erosion and the drying of springs. [page needed] Modern ideas of ecosystem services probably began when Marsh challenged in 1864 the idea that Earth's natural resources are unbounded by pointing out changes in soil fertility in the Mediterranean. [page needed] It was not until the late 1940s that three key authors—Henry Fairfield Osborn, Jr, William Vogt, and Aldo Leopold —promoted recognition of human dependence on the environment. In 1956, Paul Sears drew attention to the critical role of the ecosystem in processing wastes and recycling nutrients. In 1970, Paul Ehrlich and Rosa Weigert called attention to "ecological systems" in their environmental science textbook and "the most subtle and dangerous threat to man's existence... the potential destruction, by man's own activities, of those ecological systems upon which the very existence of the human species depends". The term "environmental services" was introduced in a 1970 report of the Study of Critical Environmental Problems, which listed services including insect pollination, fisheries, climate regulation and flood control. In following years, variations of the term were used, but eventually 'ecosystem services' became the standard in scientific literature. The ecosystem services concept has continued to expand and includes socio-economic and conservation objectives, which are discussed below. A history of the concepts and terminology of ecosystem services as of 1997, can be found in Daily's book "Nature's Services: Societal Dependence on Natural Ecosystems". While Gretchen Daily's original definition distinguished between ecosystem goods and ecosystem services, Robert Costanza and colleagues' later work and that of the Millennium Ecosystem Assessment lumped all of these together as ecosystem services. Per the 2006 Millennium Ecosystem Assessment (MA), ecosystem services are "the benefits people obtain from ecosystems". The MA also delineated the four categories of ecosystem services—supporting, provisioning, regulating and cultural—discussed below. By 2010, there had evolved various working definitions and descriptions of ecosystem services in the literature. To prevent double counting in ecosystem services audits, for instance, The Economics of Ecosystems and Biodiversity (TEEB) replaced "Supporting Services" in the MA with "Habitat Services" and "ecosystem functions", defined as "a subset of the interactions between ecosystem structure and processes that underpin the capacity of an ecosystem to provide goods and services". The Millennium Ecosystem Assessment (MA) report 2005 defines Ecosystem services as benefits people obtain from ecosystems and distinguishes four categories of ecosystem services, where the so-called supporting services are regarded as the basis for the services of the other three categories. These include services such as nutrient recycling, primary production, soil formation, habitat provision and pollination. These services make it possible for the ecosystems to continue providing services such as food supply, flood regulation, and water purification. Pivotal cultural values attaching to the natural/cultivated environment rely on an area's unique character that cannot be addressed by methods that use universal scientific parameters to determine ecological structures and functions. If a natural/cultivated environment has symbolic meanings and cultural values the object of these values are not ecosystems but shaped phenomena like mountains, lakes, forests, and, mainly, symbolic landscapes. Those cultural values do result not from properties produced by ecosystems but are the product of a specific way of seeing within the given cultural framework of symbolic experience. In New York City, where the quality of drinking water had fallen below standards required by the U.S. Environmental Protection Agency (EPA), authorities opted to restore the polluted Catskill Watershed that had previously provided the city with the ecosystem service of water purification. Once the input of sewage and pesticides to the watershed area was reduced, natural abiotic processes such as soil absorption and filtration of chemicals, together with biotic recycling via root systems and soil microorganisms, water quality improved to levels that met government standards. The cost of this investment in natural capital was estimated between $1–1.5 billion, which contrasted dramatically with the estimated $6–8 billion cost of constructing a water filtration plant plus the $300 million annual running costs. Pollination of crops by bees is required for 15–30% of U.S. food production; most large-scale farmers import non-native honey bees to provide this service. One study  reports that in California's agricultural region, it was found that wild bees alone could provide partial or complete pollination services or enhance the services provided by honey bees through behavioral interactions. However, intensified agricultural practices can quickly erode pollination services through the loss of species. The remaining species are unable to compensate this. The results of this study also indicate that the proportion of chaparral and oak-woodland habitat available for wild bees within 1–2 km of a farm can stabilize and enhance the provision of pollination services. The presence of such ecosystem elements functions almost like an insurance policy for farmers. In watersheds of the Yangtze River (China), spatial models for water flow through different forest habitats were created to determine potential contributions for hydroelectric power in the region. By quantifying the relative value of ecological parameters (vegetation-soil-slope complexes), researchers were able to estimate the annual economic benefit of maintaining forests in the watershed for power services to be 2.2 times that if it were harvested once for timber. In the 1980s, mineral water company Vittel (now a brand of Nestlé Waters) faced a critical problem. Nitrates and pesticides were entering the company's springs in northeastern France. Local farmers had intensified agricultural practices and cleared native vegetation that previously had filtered water before it seeped into the aquifer used by Vittel. This contamination threatened the company's right to use the "natural mineral water" label under French law. In response to this business risk, Vittel developed an incentive package for farmers to improve their agricultural practices and consequently reduce water pollution that had affected Vittel's product. For example, Vittel provided subsidies and free technical assistance to farmers in exchange for farmers' agreement to enhance pasture management, reforest catchments, and reduce the use of agrochemicals. This is an example of a payment for ecosystem services program. It was counted that to plant 15 000 ha new woodland in the UK, if we consider only the value of timber, it would cost £79 000 000 which is more than the benefit of £65 000 000. If, however, we include all other benefits the trees in lowland could provide (like soil stabilization, wind deflection, recreation, food production, air purification, carbon storage, wildlife habitat, fuel production, cooling, flood prevention), the costs will increase due to displacing the profitable farmland (would be around £231 000 000) but will be overweight by benefits of £546 000 000. In Europe, various projects are implemented in order to define the values of concrete ecosystems and to implement this concept into decision making process. For example, "LIFE Viva grass" project aims to do this with grasslands in Baltics. Understanding of ecosystem services requires a strong foundation in ecology, which describes the underlying principles and interactions of organisms and the environment. Since the scales at which these entities interact can vary from microbes to landscapes, milliseconds to millions of years, one of the greatest remaining challenges is the descriptive characterization of energy and material flow between them. For example, the area of a forest floor, the detritus upon it, the microorganisms in the soil and characteristics of the soil itself will all contribute to the abilities of that forest for providing ecosystem services like carbon sequestration, water purification, and erosion prevention to other areas within the watershed. Note that it is often possible for multiple services to be bundled together and when benefits of targeted objectives are secured, there may also be ancillary benefits—the same forest may provide habitat for other organisms as well as human recreation, which are also ecosystem services. measurement of the spatial and temporal scales ESPs and their services operate on. Recently, a technique has been developed to improve and standardize the evaluation of ESP functionality by quantifying the relative importance of different species in terms of their efficiency and abundance. Such parameters provide indications of how species respond to changes in the environment (i.e. predators, resource availability, climate) and are useful for identifying species that are disproportionately important at providing ecosystem services. However, a critical drawback is that the technique does not account for the effects of interactions, which are often both complex and fundamental in maintaining an ecosystem and can involve species that are not readily detected as a priority. Even so, estimating the functional structure of an ecosystem and combining it with information about individual species traits can help us understand the resilience of an ecosystem amidst environmental change. Many ecologists also believe that the provision of ecosystem services can be stabilized with biodiversity. Increasing biodiversity also benefits the variety of ecosystem services available to society. Understanding the relationship between biodiversity and an ecosystem's stability is essential to the management of natural resources and their services. The concept of ecological redundancy is sometimes referred to as functional compensation and assumes that more than one species performs a given role within an ecosystem. More specifically, it is characterized by a particular species increasing its efficiency at providing a service when conditions are stressed in order to maintain aggregate stability in the ecosystem. However, such increased dependence on a compensating species places additional stress on the ecosystem and often enhances its susceptibility to subsequent disturbance. The redundancy hypothesis can be summarized as "species redundancy enhances ecosystem resilience". Another idea uses the analogy of rivets in an airplane wing to compare the exponential effect the loss of each species will have on the function of an ecosystem; this is sometimes referred to as rivet popping. If only one species disappears, the loss of the ecosystem's efficiency as a whole is relatively small; however, if several species are lost, the system essentially collapses—similar to an airplane that lost too many rivets. The hypothesis assumes that species are relatively specialized in their roles and that their ability to compensate for one another is less than in the redundancy hypothesis. As a result, the loss of any species is critical to the performance of the ecosystem. The key difference is the rate at which the loss of species affects total ecosystem functioning. A third explanation, known as the portfolio effect, compares biodiversity to stock holdings, where diversification minimizes the volatility of the investment, or in this case, the risk of instability of ecosystem services. This is related to the idea of response diversity where a suite of species will exhibit differential responses to a given environmental perturbation. When considered together, they create a stabilizing function that preserves the integrity of a service. Several experiments have tested these hypotheses in both the field and the lab. In ECOTRON, a laboratory in the UK where many of the biotic and abiotic factors of nature can be simulated, studies have focused on the effects of earthworms and symbiotic bacteria on plant roots. These laboratory experiments seem to favor the rivet hypothesis. However, a study on grasslands at Cedar Creek Reserve in Minnesota supports the redundancy hypothesis, as have many other field studies. There are questions regarding the environmental and economic values of ecosystem services. Some people may be unaware of the environment in general and humanity's interrelatedness with the natural environment, which may cause misconceptions. Although environmental awareness is rapidly improving in our contemporary world, ecosystem capital and its flow are still poorly understood, threats continue to impose, and we suffer from the so-called 'tragedy of the commons'. Many efforts to inform decision-makers of current versus future costs and benefits now involve organizing and translating scientific knowledge to economics, which articulate the consequences of our choices in comparable units of impact on human well-being. An especially challenging aspect of this process is that interpreting ecological information collected from one spatial-temporal scale does not necessarily mean it can be applied at another; understanding the dynamics of ecological processes relative to ecosystem services is essential in aiding economic decisions. Weighting factors such as a service's irreplaceability or bundled services can also allocate economic value such that goal attainment becomes more efficient. A peer-reviewed study published in 1997 estimated the value of the world's ecosystem services and natural capital to be between US$16–54 trillion per year, with an average of US$33 trillion per year. However, Salles (2011) indicates 'The total value of biodiversity is infinite, so having debate about what is the total value of nature is actually pointless because we can't live without it'. Although monetary pricing continues with respect to the valuation of ecosystem services, the challenges in policy implementation and management are significant and multitudinous. The administration of common pool resources is a subject of extensive academic pursuit. From defining the problems to finding solutions that can be applied in practical and sustainable ways, there is much to overcome. Considering options must balance present and future human needs, and decision-makers must frequently work from valid but incomplete information. Existing legal policies are often considered insufficient since they typically pertain to human health-based standards that are mismatched with necessary means to protect ecosystem health and services. To improve the information available, one suggestion has involved the implementation of an Ecosystem Services Framework (ESF), which integrates the biophysical and socio-economic dimensions of protecting the environment and is designed to guide institutions through multidisciplinary information and jargon, helping to direct strategic choices. Novel and expedient methods are needed to deal with managing Earth's ecosystem services. Local to regional collective management efforts might be considered appropriate for services like crop pollination or resources like water. Another approach that has become increasingly popular over the last decade is the marketing of ecosystem services protection. Payment and trading of services is an emerging worldwide small-scale solution where one can acquire credits for activities such as sponsoring the protection of carbon sequestration sources or the restoration of ecosystem service providers. In some cases, banks for handling such credits have been established and conservation companies have even gone public on stock exchanges, defining an evermore parallel link with economic endeavors and opportunities for tying into social perceptions. However, crucial for implementation are clearly defined land rights, which is often lacking in many developing countries. In particular, many forest-rich developing countries suffering deforestation experience conflict between different forest stakeholders. In addition, concerns for such global transactions include inconsistent compensation for services or resources sacrificed elsewhere and misconceived warrants for irresponsible use. Another approach has been focused on protecting ecosystem service 'hotspots'. Recognition that the conservation of many ecosystem services aligns with more traditional conservation goals (i.e. biodiversity) has led to the suggested merging of objectives for maximizing their mutual success. This may be particularly strategic when employing networks that permit the flow of services across landscapes, and might also facilitate securing the financial means to protect services through a diversification of investors. For example, in recent years there has been interest in the valuation of ecosystem services provided by shellfish production and restoration. A keystone species, low in the food chain, bivalve shellfish such as oysters support a complex community of species by performing a number of functions essential to the diverse array of species that surround them. There is also increasing recognition that some shellfish species may impact or control many ecological processes; so much so that they are included on the list of "ecosystem engineers"—organisms that physically, biologically or chemically modify the environment around them in ways that influence the health of other organisms. Many of the ecological functions and processes performed or affected by shellfish contribute to human well-being by providing a stream of valuable ecosystem services over time by filtering out particulate materials and potentially mitigating water quality issues by controlling excess nutrients in the water. Ecosystem-based adaptation or EbA is an emerging strategy for community development and environmental management that seeks to use an ecosystem services framework to help communities adapt to the effects of climate change. The Convention on Biological Diversity currently defines Ecosystem-Based Adaptation as "the use of biodiversity and ecosystem services to help people adapt to the adverse effects of climate change", which includes the use of "sustainable management, conservation and restoration of ecosystems, as part of an overall adaptation strategy that takes into account the multiple social, economic and cultural co-benefits for local communities". In 2001, the Millennium Ecosystem Assessment announced that humanity's impact on the natural world was increasing to levels never before seen, and that the degradation of the planet's ecosystems would become a major barrier to achieving the Millennium Development Goals. In recognition of this fact, Ecosystem-Based Adaptation seeks to use the restoration of ecosystems as a stepping-stone to improving the quality of life in communities experiencing the impacts of climate change. Specifically, this involves the restoration of ecosystems that provide the community with essential services, such as the provisioning of food and water and protection from storm surges and flooding. EbA interventions typically combine elements of both climate change mitigation and adaptation to global warming to help address the community's current and future needs. Collaborative planning between scientists, policy makers, and community members is an essential element of Ecosystem-Based Adaptation. By drawing on the expertise of outside experts and local residents alike, EbA seeks to develop unique solutions to unique problems, rather than simply replicating past projects. Ecosystem services are defined as the gains acquired by humankind from surroundings ecosystems. Four different types of ecosystem services have been distinguished by the scientific body: regulating services, provisioning services, cultural services and supporting services. An ecosystem does not necessarily offer all four types of services simultaneously; but given the intricate nature of any ecosystem, it is usually assumed that humans benefit from a combination of these services. The services offered by diverse types of ecosystems (forests, seas, coral reefs, mangroves, etc.) differ in nature and in consequence. In fact, some services directly affect the livelihood of neighboring human populations (such as fresh water, food or aesthetic value, etc.) while other services affect general environmental conditions by which humans are indirectly impacted (such as climate change, erosion regulation or natural hazard regulation, etc.). Estuarine and coastal ecosystems are both marine ecosystems. An estuary is defined as the area in which a river meets the sea or the ocean. The waters surrounding this area are predominantly salty waters or brackish waters; and the incoming river water is dynamically motioned by the tide. An estuary strip may be covered by populations of reed (or similar plants) and/or sandbanks (or similar form or land). A coastal ecosystem occurs in areas where the sea or ocean waters meet the land. Regulating services are the "benefits obtained from the regulation of ecosystem processes". In the case of coastal and estuarine ecosystems, these services include climate regulation, waste treatment and disease control and natural hazard regulation. Both the biotic and abiotic ensembles of marine ecosystems play a role in climate regulation. They act as sponges when it comes to gases in the atmosphere, retaining large levels of CO2 and other greenhouse gases (methane and nitrous oxide). Marine plants also use CO2 for photosynthesis purposes and help in reducing the atmospheric CO2. The oceans and seas absorb the heat from the atmosphere and redistribute it through the means of water currents, and atmospheric processes, such as evaporation and the reflection of light allow for the cooling and warming of the overlying atmosphere. The ocean temperatures are thus imperative to the regulation of the atmospheric temperatures in any part of the world: "without the ocean, the Earth would be unbearably hot during the daylight hours and frigidly cold, if not frozen, at night". Another service offered by marine ecosystem is the treatment of wastes, thus helping in the regulation of diseases. Wastes can be diluted and detoxified through transport across marine ecosystems; pollutants are removed from the environment and stored, buried or recycled in marine ecosystems: "Marine ecosystems break down organic waste through microbial communities that filter water, reduce/limit the effects of eutrophication, and break down toxic hydrocarbons into their basic components such as carbon dioxide, nitrogen, phosphorus, and water". The fact that waste is diluted with large volumes of water and moves with water currents leads to the regulation of diseases and the reduction of toxics in seafood. Coastal and estuarine ecosystems act as buffer zones against natural hazards and environmental disturbances, such as floods, cyclones, tidal surges and storms. The role they play is to "[absorb] a portion of the impact and thus [lessen] its effect on the land". Wetlands, for example, and the vegetation it supports – trees, root mats, etc. – retain large amounts of water (surface water, snowmelt, rain, groundwater) and then slowly releases them back, decreasing the likeliness of floods. Mangrove forests protect coastal shorelines from tidal erosion or erosion by currents; a process that was studied after the 1999 cyclone that hit India. Villages that were surrounded with mangrove forests encountered less damages than other villages that weren't protected by mangroves. Provisioning services consist of all "the products obtained from ecosystems". Marine ecosystems provide people with: wild & cultured seafood, fresh water, fiber & fuel and biochemical & genetic resources. Humans consume a large number of products originating from the seas, whether as a nutritious product or for use in other sectors: "More than one billion people worldwide, or one-sixth of the global population, rely on fish as their main source of animal protein. In 2000, marine and coastal fisheries accounted for 12 per cent of world food production". Fish and other edible marine products – primarily fish, shellfish, roe and seaweeds – constitute for populations living along the coast the main elements of the local cultural diets, norms and traditions. A very pertinent example would be sushi, the national food of Japan, which consists mostly of different types of fish and seaweed. Water bodies that are not highly concentrated in salts are referred to as 'fresh water' bodies. Fresh water may run through lakes, rivers and streams, to name a few; but it is most prominently found in the frozen state or as soil moisture or buried deep underground. Fresh water is not only important for the survival of humans, but also for the survival of all the existing species of animals, plants. Marine creatures provide us with the raw materials needed for the manufacturing of clothing, building materials (lime extracted from coral reefs), ornamental items and personal-use items (luffas, art and jewelry): "The skin of marine mammals for clothing, gas deposits for energy production, lime (extracted from coral reefs) for building construction, and the timber of mangroves and coastal forests for shelter are some of the more familiar uses of marine organisms. Raw marine materials are utilized for non-essential goods as well, such as shells and corals in ornamental items". Humans have also referred to processes within marine environments for the production of renewable energy: using the power of waves – or tidal power – as a source of energy for the powering of a turbine, for example. Oceans and seas are used as sites for offshore oil and gas installations, offshore wind farms. Biochemical resources are compounds extracted from marine organisms for use in medicines, pharmaceuticals, cosmetics and other biochemical products. Genetic resources are the genetic information found in marine organisms that would later on be used for animal and plant breeding and for technological advances in the biological field. These resources are either directly taken out from an organism – such as fish oil as a source of omega3 –, or used as a model for innovative man-made products: "such as the construction of fiber optics technology based on the properties of sponges. ... Compared to terrestrial products, marine-sourced products tend to be more highly bioactive, likely due to the fact that marine organisms have to retain their potency despite being diluted in the surrounding sea-water". Cultural services relate to the non-material world, as they benefit the benefit recreational, aesthetic, cognitive and spiritual activities, which are not easily quantifiable in monetary terms. Marine environments have been used by many as an inspiration for their works of art, music, architecture, traditions... Water environments are spiritually important as a lot of people view them as a means for rejuvenation and change of perspective. Many also consider the water as being a part of their personality, especially if they have lived near it since they were kids: they associate it to fond memories and past experiences. Living near water bodies for a long time results in a certain set of water activities that become a ritual in the lives of people and of the culture in the region. Sea sports are very popular among coastal populations: surfing, snorkeling, whale watching, kayaking, recreational fishing...a lot of tourists also travel to resorts close to the sea or rivers or lakes to be able to experience these activities, and relax near the water. A lot can be learned from marine processes, environments and organisms – that could be implemented into our daily actions and into the scientific domain. Although much is still yet to still be known about the ocean world: "by the extraordinary intricacy and complexity of the marine environment and how it is influenced by large spatial scales, time lags, and cumulative effects". Supporting services are the services that allow for the other ecosystem services to be present. They have indirect impacts on humans that last over a long period of time. Several services can be considered as being both supporting services and regulating/cultural/provisioning services. Nutrient cycling is the movement of nutrients through an ecosystem by biotic and abiotic processes. The ocean is a vast storage pool for these nutrients, such as carbon, nitrogen and phosphorus. The nutrients are absorbed by the basic organisms of the marine food web and are thus transferred from one organism to the other and from one ecosystem to the other. Nutrients are recycled through the life cycle of organisms as they die and decompose, releasing the nutrients into the neighboring environment. "The service of nutrient cycling eventually impacts all other ecosystem services as all living things require a constant supply of nutrients to survive". Biologically mediated habitats are defined as being the habitats that living marine structures offer to other organisms. These need not to be designed for the sole purpose of serving as a habitat, but happen to become living quarters whilst growing naturally. For example, coral reefs and mangrove forests are home to numerous species of fish, seaweed and shellfish... The importance of these habitats is that they allow for interactions between different species, aiding the provisioning of marine goods and services. They are also very important for the growth at the early life stages of marine species (breeding and bursary spaces), as they serve as a food source and as a shelter from predators. Primary production refers to the production of organic matter, i.e., chemically bound energy, through processes such as photosynthesis and chemosynthesis. The organic matter produced by primary producers forms the basis of all food webs. Further, it generates oxygen (O2), a molecule necessary to sustain animals and humans. Opportunities such as implementing and communicating sustainable purchasing, operating, or investment practices in order to differentiate corporate brands. Ecosystem services decisions require making complex choices at the intersection of ecology, technology, society and the economy. The process of making ecosystem services decisions must consider the interaction of many types of information, honor all stakeholder viewpoints, including regulatory agencies, proposal proponents, decision makers, residents, NGOs, and measure the impacts on all four parts of the intersection. These decisions are usually spatial, always multi-objective, and based on uncertain data, models, and estimates. Often it is the combination of the best science combined with the stakeholder values, estimates and opinions that drive the process. One analytical study modeled the stakeholders as agents to support water resource management decisions in the Middle Rio Grande basin of New Mexico. This study focused on modeling the stakeholder inputs across a spatial decision, but ignored uncertainty. Another study used Monte Carlo methods to exercise econometric models of landowner decisions in a study of the effects of land-use change. Here the stakeholder inputs were modeled as random effects to reflect the uncertainty. A third study used a Bayesian decision support system to both model the uncertainty in the scientific information Bayes Nets and to assist collecting and fusing the input from stakeholders. This study was about siting wave energy devices off the Oregon Coast, but presents a general method for managing uncertain spatial science and stakeholder information in a decision making environment. Remote sensing data and analyses can be used to assess the health and extent of land cover classes that provide ecosystem services, which aids in planning, management, monitoring of stakeholders' actions, and communication between stakeholders. In Baltic countries scientists, nature conservationists and local authorities are implementing integrated planning approach for grassland ecosystems. They are developing Integrated Planning Tool that will be based on GIS (geographic information system) technology and put online that will help for planners to choose the best grassland management solution for concrete grassland. It will look holistically at the processes in the countryside and help to find best grassland management solutions by taking into account both natural and socioeconomic factors of the particular site. ^ a b Millennium Ecosystem Assessment (MA). 2005. Ecosystems and Human Well-Being: Synthesis "Archived copy" (PDF). Archived (PDF) from the original on 3 December 2013. Retrieved 29 January 2013. CS1 maint: Archived copy as title (link). Island Press, Washington. 155pp. ^ Schumacher, E.F (1973). Small is Beautiful: A Study of Economics As If People Mattered. ^ a b Daily, G.C. 1997. Nature's Services: Societal Dependence on Natural Ecosystems. Island Press, Washington. 392pp. ^ Marsh, G.P. 1864 (1965). Man and Nature. Charles Scribner's Sons, New York. 472pp. ^ Osborn, F. 1948. Our Plundered Planet. Little, Brown and Company: Boston. 217pp. ^ Vogt, W. 1948. Road to Survival. William Sloan: New York. 335pp. ^ Leopold, A. 1949. A Sand County Almanac and Sketches from Here and There. Oxford University Press, New York. 226pp. ^ Sears, P.B. 1956. "The processes of environmental change by man." In: W.L. Thomas, editor. Man's Role in Changing the Face of the Earth (Volume 2). University of Chicago Press, Chicago. 1193pp. ^ Study of Critical Environmental Problems (SCEP). 1970. Man's Impact on the Global Environment. MIT Press, Cambridge. 319pp. ^ Ehrlich, P.R. and A. Ehrlich. 1981. Extinction: The Causes and Consequences of the Disappearance of Species. Random House, New York. 305pp. ^ Brown, Thomas C.; John C. Bergstrom; John B. Loomis (2007). "Defining, valuing and providing ecosystem goods and services" (PDF). Natural Resources Journal. 47 (2): 329–376. Archived from the original (PDF) on 25 May 2013. ^ Daily, Gretchen C.; Söderqvist, Tore; Aniyar, Sara; Arrow, Kenneth; Dasgupta, Partha; Ehrlich, Paul R.; Folke, Carl; Jansson, AnnMari; Jansson, Bengt-Owe (21 July 2000). "The Value of Nature and the Nature of Value". Science. 289 (5478): 395–396. doi:10.1126/science.289.5478.395. ISSN 0036-8075. PMID 10939949. ^ "Conservation of ecosystem services". basicbiology.net. Adam Purcell. Archived from the original on 29 November 2014. ^ Daniel, T. C. et al. 2012: Contributions of cultural services to the ecosystem services agenda. Proc. Natl. Acad. Sci. USA 109: 8812–8819 . ^ Kirchhoff, T. 2012: Pivotal cultural values of nature cannot be integrated into the ecosystem services framework. Proc. Natl. Acad. Sci. USA 109 (46): E3146. ^ Cf. Cosgrove, D.E. 1984: Social Formation and Symbolic Landscape, London; Schama, S. 1995: Landscape and memory. New York; Kirchhoff, T./Trepl, L./Vicenzotti, V. 2012:What is landscape ecology? An analysis and evaluation of six different conceptions. Landscape Research iFirst. ^ Cf. Cosgrove, D.E. 1984: Social Formation and Symbolic Landscape, London; Schama, S. 1995: Landscape and memory. New York; Backhaus, G./Murungi, J. (eds. ): Symbolic Landscapes. Dordrecht 2009. ^ Chichilnisky, G. and G. Heal. 1998. Economic returns from the biosphere. Nature 391: 629-630. ^ a b c Kremen, C. 2005. Managing ecosystem services: what do we need to know about their ecology? Ecology Letters 8: 468-479. ^ Guo, Z.W., X.M. Xio and D.M. Li. 2000. An assessment of ecosystem services: water flow regulation and hydroelectric power production. Ecological Applications 10: 925-936. ^ Hanson, C, J Ranganathan, C Iceland, and J Finisdore. (2008) The Corporate Ecosystem Services Review (Version 1.0). World Resources Institute. ^ Perrot-Maître, D. (2006) The Vittel payments for ecosystem services: a "perfect" PES case? International Institute for Environment and Development, London, UK. ^ "LIFE Viva Grass | Integrated planning tool for grassland ecosystem services". vivagrass.eu. Archived from the original on 7 August 2016. Retrieved 6 September 2016. ^ Balvanera, P. C. Kremen, and M. Martinez. 2005. Applying community structure analysis to ecosystem function: examples from pollination and carbon storage. Ecological Applications 15: 360-375. ^ Walker, B.H. 1992. "Biodiversity and ecological redundancy." Conservation Biology 6: 18-23. ^ Frost, T.M., S.R. Carpenter, A.R. Ives, and T.K. Kratz. 1995. "Species compensation and complementarity in ecosystem function." In: C. Jones and J. Lawton, editors. Linking species and ecosystems. Chapman & Hall, London. 387pp. ^ Naeem S. 1998. "Species redundancy and ecosystem reliability" Conservation Biology 12: 39–45. ^ a b Lawton, J.H. 1994. What do species do in ecosystems? Oikos 71: 367-374. ^ Tilman, D., C.L. Lehman, and C.E. Bristow. 1998. Diversity-stability relationships: statistical inevitability or ecological consequence?" The American Naturalist 151: 277-282. ^ Elmqvist, T., C. Folke, M. Nyström, G. Peterson, J. Bengtsson, B. Walker and J. Norberg. 2003. Response diversity, ecosystem change, and resilience. Frontiers in Ecology and the Environment 1: 488-494. ^ Raudsepp-Hearne, C. et al. 2010. Untangling the Environmentalist's Paradox: Why is Human Well-being Increasing as Ecosystem Services Degrade? Bioscience 60(8) 576–589. ^ Hardin, G. 1968. The tragedy of the commons" Science 162: 1243-1248. ^ a b Daily, G.C., T. Söderqvist, S. Aniyar, K. Arrow, P. Dasgupta, P.R. Ehrlich, C. Folke, A. Jansson, B. Jansson, N. Kautsky, S. Levin, J. Lubchenco, K. Mäler, D. Simpson, D. Starrett, D. Tilman, and B. Walker. 2000. The value of nature and the nature of value" Science 289: 395-396. ^ DeFries, R.S., J.A. Foley, and G.P. Asner. 2004. Land-use choices: balancing human needs and ecosystem function. Frontiers in Ecology and the Environment 2: 249-257. ^ Gorriz-Misfud, Elena; Varela, Elsa; Piqué, Miriam; Prokofieva, Irina (2016). "Demand and supply of ecosystem services in a Mediterranean forest: Computing payment boundaries" (PDF). Ecosystem Services. 17: 53–63. doi:10.1016/j.ecoser.2015.11.006. Archived (PDF) from the original on 6 August 2016. ^ Farber, S.C., R. Costanza and M.A. Wilson. 2002. Economic and ecological concepts for valuing ecosystem services. Ecological Economics 41: 375-392. ^ Costanza, Robert; d'Arge, Ralph; de Groot, Rudolf; Farberk, Stephen; Grasso, Monica; Hannon, Bruce; Limburg, Karin; Naeem, Shahid; O'Neill, Robert V.; Paruelo, Jose; Raskin, Robert G.; Sutton, Paul; van den Belt, Marjan (15 May 1997). "The value of the world's ecosystem services and natural capital" (PDF). Nature. 387 (6630): 253–260. doi:10.1038/387253a0. Archived from the original (PDF) on 30 July 2012. Retrieved 8 August 2012. ^ a b Ostrom, E. 1990. Governing the Commons: The Evolution of Institutions for Collective Action. Cambridge University Press, Cambridge. 279pp. ^ Dietz, T. E. Ostrom and P.C. Stern. 2003. The struggle to govern the commons" Science 302: 1907-1912. ^ Pretty, J. 2003. Social capital and the collective management of resources" Science 302: 1912-1914. ^ Heikkila, T. 2004. Institutional boundaries and common-pool resource management: a comparative analysis of water management programs in California. Journal of Policy Analysis and Management from Association for Public Policy Analysis and Management 23: 97-117. ^ Gibson, C.C., J.T. Williams and E. Ostrom. 2005. Local management and better forests. World Development 33: 273-284. ^ Daily, G.C. 2000. Management objectives for the protection of ecosystem services. Environmental Science & Policy 3: 333-339. ^ Balvanera, P., G.C. Daily, P.R. Ehrlich, T.H. Ricketts, S.Bailey, S. Kark, C. Kremen and H. Pereira. 2001. Conserving biodiversity and ecosystem services. Science 291: 2047. ^ Chan, K.M.A., M.R. Shaw, D.R. Cameron, E.C. Underwood and G.C. Daily. 2006. Conservation planning for ecosystem services. PLoS Biology 4: 2138-2152. ^ Northern Economics Inc. "Valuation of Ecosystem Services from Shellfish Restoration, Enhancement and Management: A Review of the Literature" (PDF). Prepared for Pacific Shellfish Institute. Archived (PDF) from the original on 3 December 2013. ^ Jones; Lawton, and Shachak (1994). "Organisms as Ecosystem Engineers". Oikos. 69 (3): 373–386. doi:10.2307/3545850. JSTOR 3545850. ^ "Millennium Ecosystem Assessment". www.millenniumassessment.org. Archived from the original on 24 February 2018. Retrieved 28 April 2018. ^ Campos, A.C.; Hernandez, M.E. ; Moreno-Casasola, P.; Espinosa, E.C. ; Robledo, A.R. & Mata, D.I. Hydrological Sciences Journal, December 2011. ^ "Nutrient Cycles: Recycling in Ecosystems, The Carbon and Nitrogen Cycles - ScienceAid". ScienceAid. Retrieved 16 May 2018. ^ "isbn:1118506243 - Google zoeken". books.google.be. Retrieved 28 April 2018. ^ "Ecosystem Services". msu.edu. Archived from the original on 28 December 2017. Retrieved 28 April 2018. ^ "Oxygen and Human Requirements". www.geography.hunter.cuny.edu. Archived from the original on 22 October 2017. Retrieved 28 April 2018. ^ "BBC - GCSE Bitesize: Inhaled and exhaled air". bbc.co.uk. Archived from the original on 26 October 2017. Retrieved 28 April 2018. ^ "Our Ecosystem - Mapping & Data Sharing Software". Ecometrica. Archived from the original on 17 June 2013. Retrieved 9 July 2012. ^ "ARIES :: ARtificial Intelligence for Ecosystem Services". Ariesonline.org. Archived from the original on 7 June 2012. Retrieved 9 July 2012. ^ "Welcome". Natural Value Initiative. Archived from the original on 16 May 2016. Retrieved 9 July 2012. ^ "Home". Natural Capital Project. Archived from the original on 28 June 2012. Retrieved 9 July 2012. ^ Gorriz-Misfud, Elena; Secco, L; Pisani, E (2016). "Exploring the interlinkages between governance and social capital: A dynamic model for forestry". Forest Policy and Economics. 65: 25–36. doi:10.1016/j.forpol.2016.01.006. ^ Lewis D. J.; R. J. Alig (2009). "Empirical Methods for Modeling Landscape Change, Ecosystem Services, and Biodiversity" (PDF). Western Economics Forum. Archived (PDF) from the original on 20 October 2011. ^ Ullman D. G.; K. Halsey; C. Goldfinger (2013). "Managing Eco-System Services Decisions" (PDF). Archived (PDF) from the original on 6 June 2013. Farber, S., Costanza, R., Childers, D.L., Erickson, J., Gross, K., Grove, M., Hopkinson, C.S., Kahn, J., Pincetl, S., Troy, A., Warren, P. and M. Wilson, "Linking Ecology and Economics for Ecosystem Management," Bioscience 56(2): 121-133, 2006. Salles, J-M, "Valuing biodiversity and ecosystem services: Why put economic values on Nature?" Comptes Rendus Biologies 334(5–6): 469–82, 2011. Vo Quoc, T., Kuenzer, C., Vo Quang, M., Moder, F., Oppelt, N., "Review of Valuation Methods for Mangrove Ecosystem Services," Journal of Ecological Indicators 23: 431-446, 2012.